This morning Amazon announced a new HDMI streaming device called the Fire TV Stick, which is already available for pre-order and will ship before black Friday. (Nov. 19th) Amazon is offering Prime members, or those who sign up for Prime, special pricing on the stick for only $19, for the next 48 hours, after which it will retail for $39. Many might be quick to compare this to Google’s Chromecast stick, but unlike Chromecast, Amazon’s Fire TV Stick won’t require another device to use it. 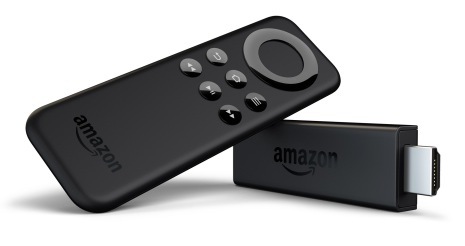 Amazon’s streaming stick comes with a remote and most, but not all, of the functionality of their $99 Fire TV box. The Fire TV Stick has a dual-core processor (Broadcom Capri 28155, dual-core 2xARM A9), 1GB of RAM, 8GB of storage, Bluetooth 3.0 and dual-band, dual-antenna Wi-Fi (MIMO). From a CPU standpoint, on paper it beats Roku’s Streaming Stick and Google Chromecast in terms of performance many times over. The Fire TV Stick comes with the same user interface as the Fire TV and has support for all of the current content channels on the Fire TV, with the exception of some gaming apps. Casual games can still be played on the stick, like Angry Birds, but some complex games, requiring more controls aren’t supported. The remote that comes with the Fire TV Stick doesn’t have the same voice search functionality as the Fire TV remote, but it is compatible with the voice remote if bought separately for $29. Users can also use a free Android app on their phone to search for content with their voice and Amazon says an app for iOS is coming shortly. Non-gaming apps that are written for Fire TV will automatically work on the Fire TV Stick, which is also based on a flavor of Android. Amazon also confirmed that they are on track to have support for HBO Go on the Fire TV before the end of December, with the Fire TV Stick getting HBO GO in the new year. Amazon told me they have “made a lot” of the Fire TV Sticks in preparation for the pre-orders, but in usual Amazon fashion, won’t disclose how many are available before they sell out or if they expect there to be a shortage during the holidays. Amazon has placed a buying limit of two devices per Prime member, at the special $19 price point. While Amazon’s new stick is good for consumers, it’s bad news for Roku, which now has even more competition, at a lower price point. I love my Roku box and it still has more premium content channels than any other $99 or less device, but it’s only a matter of time before Amazon’s streaming stick, or Google’s new Nexus Player for that matter, catches up with Roku in terms of content choices. Roku simply can’t compete with Amazon or Google’s marketing dominance and their ability to package these products in with other services. In the long run, the non-gaming streaming device space is going to be won by Apple, Google and Amazon. They all control multiple devices that tie into a larger ecosystem, make money from many avenues and at some point, Amazon or Google is going to get the price on these sticks down to where they are free. It’s not hard to imagine Amazon giving them away with a Prime membership or Google giving it away with a Nexus tablet or phone. At $19, the price point doesn’t have far to go before it reaches zero.